Serving police officers and police staff in Lincolnshire were recognised at a ceremony this week for outstanding examples of policing where they have shown dedication and good service. Nineteen were awarded the Chief Constable’s certificates of commendation for excellent work including efforts to tackle rural crime (Operation Galileo) and an enormous fraud investigation (Operation Tarlac). Thirteen Officers received a police Long Service and Good Conduct Medal and one police staff member was commended for 20 years of service. Between these recipients they have provided 280 years of service. Opening the awards Chief Constable Bill Skelly said: “A career in policing is exceptionally challenging but rewarding for those who go the extra mile. The awards were presented by Rachel Watson, Head of Police Workforce and Capability Unit at the Home Office. The ceremony was also attended by Deputy Police and Crime Commissioner Stuart Tweedale and Inspector Jon Hassall from the Police Federation. The Long Service and Good Conduct Medals were first instituted by King George VI in 1951. It is awarded as a mark of the Sovereign’s appreciation of Long and Meritorious Service rendered by members of the police forces of the United Kingdom, The Isle of Man and the Channel Islands. The Police Federation provides support on these special occasions by providing a gift for the partners of the police officers receiving their long service medals. Police officers awarded Long Service and Good Conduct medals are based in Lincoln, Bracebridge Heath, Grantham, Spalding and Boston, while members of the rural crim eteam also operation out of Sleaford. Certificates of commendation went to PCs Martin Green (from Sleaford), James Perring, Nick Willey and Chief Inspector James Tyner, who heads up the team as well as being in charge of officers in the west of the Kestevens including Sleaford. In 2016/17 Lincolnshire Police received over 2,200 reports of hare coursing incidents across the county. Hare coursing is said by the force to be perpetrated by people who have little consideration for the welfare of their own dogs or of the hare, nor do they respect the rights of others living in the rural community. These individuals are often abusive, offer violence, drive recklessly and cause significant damage to property and land. In December 2017 a meeting was held in which many of the victims of this crime, supported by a number of MPs, asked the Chief Constable to intervene and make a difference. As a result a new approach was developed. The real challenge was to tackle a complex and geographically challenging issue within existing resources. Operation Galileo delivered many innovative and creative ways of working. This included investment in vehicles, drones, training and equipment through to how the police intervene and manage offenders through the Criminal Justice System. This year, the operation has resulted in a significant reduction in offences (around 30 per cent). 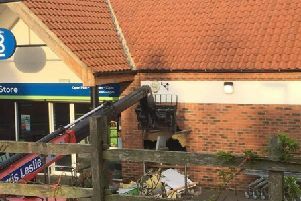 As a result of this, other forces have visited Lincolnshire with a view to understanding what has been done to achieve this and how they have made rural communities feel safer and protected. The Chief Constable said none of this could have been achieved without the four commended. Throughout the year they have led on 35 days of action targeting offenders; they have also led developing new and innovative approaches to how the force employs legislation, seeking to seize the dogs, phones, cars, driving licences and money from offenders to disrupt them, as well as having them excluded from Lincolnshire. The Rural Crime Team have helped develop how the force more effectively engages with farmers using a ‘whatsapp’ application, they have trained officers across the force around the relevant legislation and its practical application and they have been on call and made themselves available to anyone who might need help. They have supported much of the media work, allowing themselves to be filmed whilst tackling unpleasant and intimidating people. These officers have all gone well beyond what would normally be expected, says the Chief Constable.